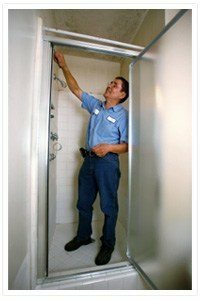 Downey Plumbing Heating & Air Conditioning is the right place to turn if you are looking for complete shower and bathtub services in Downey, California. The bathroom is supposed to be a zone for relaxation and taking care of your special needs, so you would rather want it to be in the best working and well-designed condition. That’s why the initial process of installation of your bathtub or shower is extremely important. As a homeowner you would like this process to run as smoothly as possible. Contact our trained and knowledgeable plumbers who value quality the most, and deliver the most cost-effective and adequate solutions you might need for your shower or bathtub installations. Our company can provide affordable shower installations in Downey. Enjoy both quality and comfort in the top brand showers installed by our professional techinicians according to all the installation requirements. In order to prevent water damage, the walls of your shower must also be covered. The material that is used for this purpose varies with every homeowner and eventually it is up to you to decide. The following are some suitable choices, but keep in mind that a good wall material should resist water, be appealing, easily cleaned and not decay quickly. Tile is a good shower material being water-resistant and waterproof. They come in a number of types and colors and can be maintained easily. The filling between the tiles is harder to clean – in this case various bathroom cleaning products come in handy. Stone ensures an attractive natural look of your bathroom, but it is more difficult to clean, less durable than tile and often pretty expensive. To create a unit for a shower wall, fiberglass and acrylic can be shaped in a mold. They are nice-looking and if you want your shower to be effective and affordable, opt for them. However, they are subjected to scratching and yellowing over time. There are multi-piece units that can even be installed after the original construction of the bathroom. From tub and shower replacement to repairs and installations, Downey Plumbing Heating & Air Conditioning has you fully covered. Contact us today!